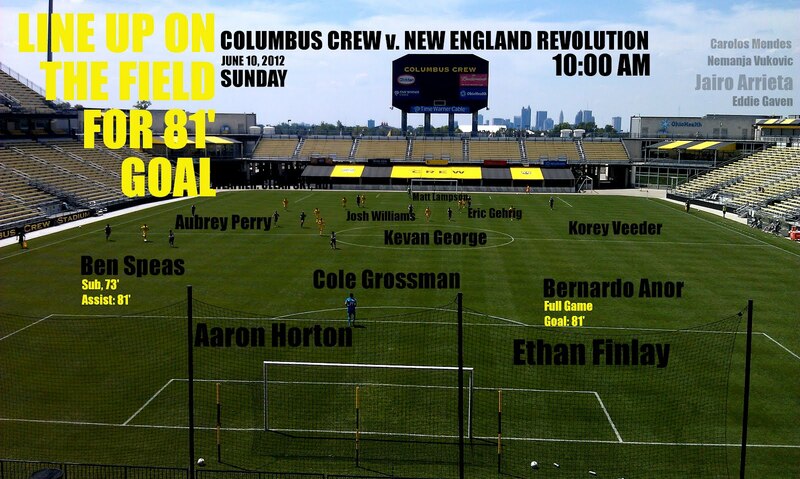 Columbus v. New England in dichotomic Reserve League action today. Headline here could be that Jairo Arrieta saw his first Crew action but, it's not. He played a rather forgettable 1st 45 and looked pretty much like a guy playing his first minutes in a new country, on a new team, in a new system, in a new league. Columbus took advantage of a long league break and fielded a mostly senior team lineup of (mostly) senior team regulars. All totaled? The Crew fielded a team with nearly four times more 2012 MLS minutes than that of the NE Revs (Crew: 4,853 to Revs: 1,294 minutes in MLS action this year). It makes this Crew follower wish the US Open Cup was taken this seriously. The Crew played well. The starting lineup featured Jairo Arrieta up top with Mr. Hustle, Ethan Finlay. In the middle we had Bernardo Anor, Milovan Mirosevic, Cole Grossman and a Mr. Kevan George. The back had Carlos Mendes and Eric Gehrig (our Sunday El Captain) in the middle. Vukovic and Williams playing the part of delivering saints. Lots of positive Crew possession but not many chances. Arrieta looked to want to impress but could not. It was very similar to Vargas' first few exhibitions. Cole, Anor and Williams had a lot of the ball. Kevan was solid and played within himself. Gehrig looked much more mature today... something I wish I could go more into but the night is closing (and the bourbon is nearly out). REGARDLESS. Good play from the armband. Columbus sat Mr. Arrieta and brought on young Aaron Horton. At first, it was hardly noticeable but he grew into the match. Horton actually seemed to open things up for Finlay, who had two of the best chances I've seen him have this year. Just as Horton and Finlay started to get going, a Mr. Ben Speas appeared. Speas who? Yes. Finally. Speas. Instantly, the club looked improved. Josh Williams, who had started in the Right Back spot, then moved to Left Back after Vukovic left and finally settled in his natural Center Back spot. There was moment in the first half where Williams was at RB and was thirsty. He called over for some water and Iribarren's man tossed out a bottle around the same time a live ball game his way. Josh had a water bottle and an soccer ball coming at him simultaneously... he was able to kick the bottle out and play the ball forward. It's a moment that you don't see often. Eventually, the ball was played out and Williams got his water. As the game progressed, what the fans on hand witnessed was a mini Ohio footballing reserve team renaissance. It produced a goal. Good exchanges between Aubrey Perry, Williams and Speas on the right side produced short cross in to Anor - who punched it in from six yards out. The Crew kept fresh legs on the pitch, 16 total players saw the field while New England only made two subs.